In the age of digital manufacturing you’ll be able to “Have it your way” (oops, wrong restaurant) like never before. At an emerging technology event in Munich the UK IT director of McDonald’s, Mark Fabes, spoke on a panel and alluded to putting 3D printers in restaurants to produce the toys that kids want instead of allowing chance to ruin their McDonald’s experience. We cannot confirm how serious they are about this but let’s do a little bit of brainstorming to help them out. Printers would be costly upfront — high-end machines from 3D Systems or Stratasys would be required to meet quality and safety standards — the introduction of rapid prototyping in restaurants could be a logistics advantage long term. Rather than having injection molds made for every toy, producing each toy in amounts based on predictions of desire, and then shipping them all over the world, raw printing materials could be shipped to locations as needed to produce every toy in-store, including future ones. Price of PLA. How much does McDonald’s spend on each Happy Meal toy? You can buy Hot Wheels for a dollar at Walmart so I suspect that it is only about 50 to 75 cents to buy a Happy Meal toy. McDonald’s buys in bulk so they may be getting it cheaper. But if you take a look at Amazon, PLA costs $30 for 1KG (2.2 lbs). In material alone 50 cents represents a fraction of an ounce! 0.6 ounces to be exact. So to break even with the current deal McDonald’s is getting, PLA would have to drop down in price at least 5 fold to make sense. Or they will have to use an even cheaper material. Things will get cheaper but now is probably not the time. Current limitations of color and speed put this plan a couple years off, but that’s all. Full-color printers already exist but the prints are sandstone and therefore not ideal for children. The speed issue could be circumvented by simply constantly printing whatever toys are being most demanded instead of waiting until a kid asks for one. But the best currently available printers could probably produce a batch of three or four toys in about 30 minutes, so we’re not far from being able to have our toys made to order in the timeframe of a typical McDonald’s visit. Safety and legal concerns. 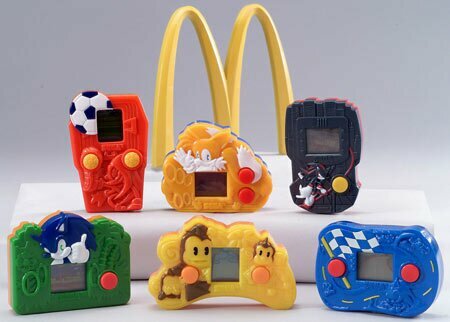 Making the toys in house with a new piece of technology would open McDonald’s up to a flurry of legal battles if these toys do not meet their satisfaction. Of course, printed Big Macs and McNuggets will be only be a few years behind the printed toys. They may even come out of the same machine.